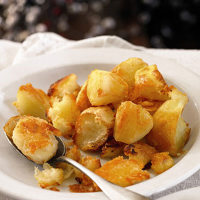 For golden-crusted roast potatoes with fluffy insides, use a floury variety, such as King Edward. Preheat the oven to 190°C, gas mark 5. Cut the potatoes into large, even-sized pieces and place in a pan of cold water. Bring to the boil and simmer for 10 minutes. Drain well and return to the pan. Shake then heat for 1-2 minutes to dry them out a little. Meanwhile, place the goose fat or sunflower oil in a roasting tin and preheat in the oven for 5 - 10 minutes. Carefully spoon the potatoes into the preheated tray of really hot fat – it should sizzle as they go in. Gently turn to coat and ensure that the potatoes are not too close together. (Too little room means steam can't escape – and that means soggy roasties.) Cook for 50-60 minutes or until golden brown, turning halfway through. Season and serve. When the turkey is resting, increase the oven temperature to 220°C, gas mark 7 to give the potatoes a really crisp and golden finish. If you need to keep them warm while finishing off the other vegetables, place the pan at the bottom of the oven but do not cover with foil, as that will make the roasties soggy. This recipe was first published in November 2009.